This book is about relations between literature, society and politics in the Arab world. It is an attempt to come to terms with the changing conceptualizations of the political in Arabic literature in recent modern history. It examines historical and contemporary conceptions of literary commitment (iltizām) and how notions of ‘writing with a cause’ have been shaped, contested, re-actualized since the 1940s until today. Against the backdrop of the current social and political transformations in the Arab world, questions on the role of the arts, specifically literature and its politics, arise with immediacy and require profound reflection and analysis. This book is about the relations between literature, society and politics in the Arab world. It is an attempt to come to terms with the changing conceptualizations of the political in Arabic literature (and to a certain extent theater and the visual arts) in recent modern history. It examines historical and contemporary conceptions of literary commitment (iltizām) and how notions of ‘writing with a cause’ have been shaped, contested, re-actualized since the 1940s until today. Starting with the present day, it looks at literary practices during the ‘Arab Spring,’ then tracks back to the beginnings of literary politicization during the 1940s and 1950s, subsequently crosses the historical caesura of the late 1960s to consider competing re-conceptualizations of literary engagement in the 1970s and 1980s, before finally returning to the 1990s through to 2011. The chapters reexamine critically both current and historical notions of the political in modern Arabic literature as well as the legacy of iltizām as a term and an agenda. 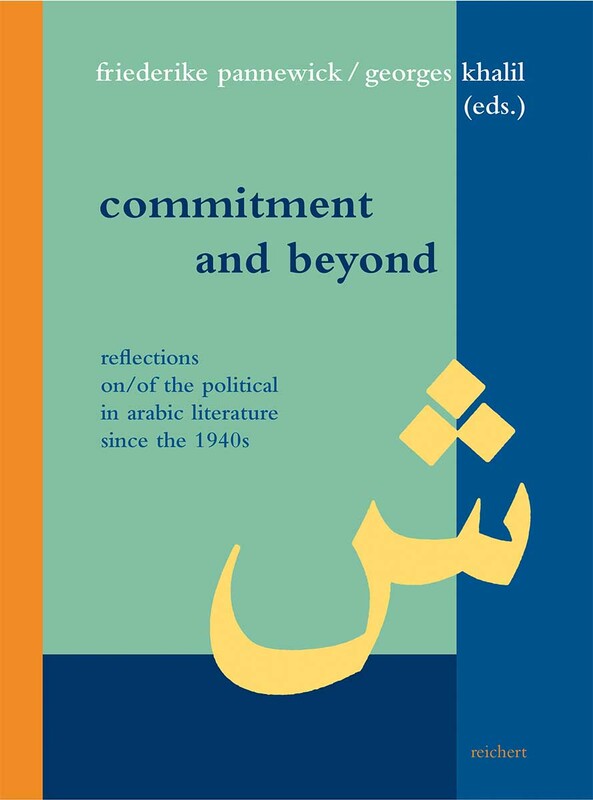 They discuss literary commitment not solely as a (completed) period in Arabic literary history but also as a vivid, changing and continuing idea that questions the role of literature and the author in and for a society. Even though a number of seminal research volumes have been published on the conceptual history of Arab literary engagement in English language, there remain no book-length studies on the ongoing relationship between the literary and the political from the 1940s until today. Therefore, what makes this volume unique and outstanding is, firstly, its point of departure in approaching the question of the ‘new political’ in Arabic literature through an interrogation of iltizām’s longevity as both a historically adaptable and adaptive literary concept—something which the ‘Arab Spring’ has forcefully brought back to our minds. Secondly, this volume brings together the attempts, propositions, and research results of both established and upcoming scholars in the field of modern Arab literary and cultural history, all of whom have initiated and undertaken exceptional contributions regarding the issue. As such, this book fills a gap in the field of Arabic Literary Studies as it explicitly reconsiders the legacy of Arab literary commitment and its manifold and heterogeneous conceptions in the light of recent and present day developments. In: Journal of Arabic Literature 48, (2017), S. 205-209. Friederike Pannewick is Professor for Arabic Literature and Culture at the Philipps-Universität Marburg, Center for Near and Middle Eastern Studies (CNMS), and co-director of the research field “Travelling Traditions: Comparative Perspectives on Near Eastern Literatures” within the research program “Europe in the Middle East – the Middle East in Europe” (EUME) at the Forum Transregionale Studien Berlin and director of the research group “Figures of Thought | Turning Points. Cultural Practices and Social Change in the Arab World” at CNMS. She is co-editor of the series “Literatures in Context: Arabic – Persian – Turkish” (Reichert) and has published extensively on modern Arabic literature and theater. Georges Khalil works at the Wissenschaftskolleg zu Berlin and is the Academic Coordinator of the Forum Transregionale Studien. He is also responsible for “Europe in the Middle East – The Middle East in Europe” (EUME), a research program that seeks to rethink key concepts and premises linking and dividing Europe and the Middle East. He was previously the coordinator of the “Working Group Modernity and Islam” from 1998 to 2006 at the Wissenschaftskolleg zu Berlin, and studied History and Islamic Studies in Hamburg and Cairo, as well as European Studies at the Europa-Kolleg Hamburg. From 1995 to 1996 he was fellow of the College for International Affairs, Robert Bosch Foundation. Yvonne Albers studied Philosophy, Theater Studies, and Arabic Studies in Leipzig and Damascus. She is currently a Research Associate at the Center for Near and Middle Eastern Studies (CNMS) at Philipps-Universität Marburg and a member of the research group “Figures of Thought | Turning Points: Cultural Practices and Social Change in the Arab World” (DFG). While her former work was concerned with contemporary theater and performance art in Lebanon, she is now writing a PhD on the Beirut-based cultural magazine Mawāqif and post-1967 aesthetic thought. Albers is also co-founder and editorial board member of the open access journal Middle East – Topics & Arguments.